About 35 students from various schools and colleges presented 21 ideas to make Punnami Ghat a happy and vibrant place at the workshop. 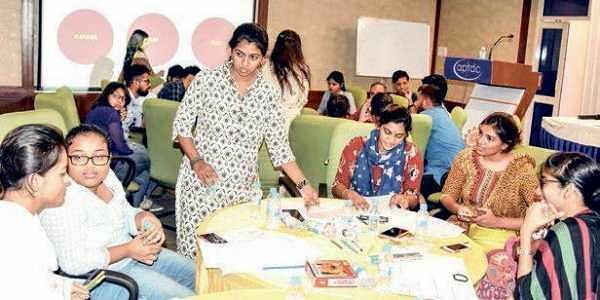 VIJAYAWADA: Involving young minds to give the city a facelift would yield good results and the ‘Transforming Vijayawada’ campaign by VMC is already setting a good example, V Rama Manohara Rao, CRDA special commissioner, said on Saturday.The commissioner was addressing the audience at a workshop organised at Punnami Ghat by CRDA as part of Happy City Hackathon. The summit would be a platform to share ideas and make Vijayawada look very attractive and it would ensure participation from public in large numbers, the commissioner said. About 35 students from various schools and colleges presented 21 ideas to make Punnami Ghat a happy and vibrant place at the workshop. The CRDA officials announced that concepts presented by the students from School of Planning and Architecture, Vijayawada, and SML DAV School were marked the best. “The concepts will be presented during the three-day Happy City summit to be held from April 10, and the winners will be felicitated by Chief Minsiter Chandrababu Naidu,” CRDA said. They added that all models presented during the workshop would be displayed to the public in an exhibition to be held for a month from April 7.